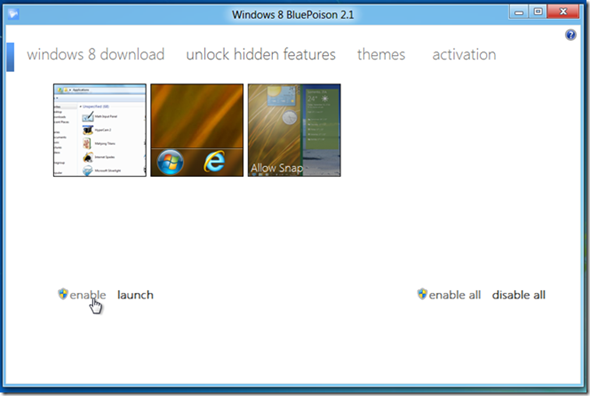 BluePoison for Windows 8: Enables Hidden Features, Customizes Start Menu Theme And More! 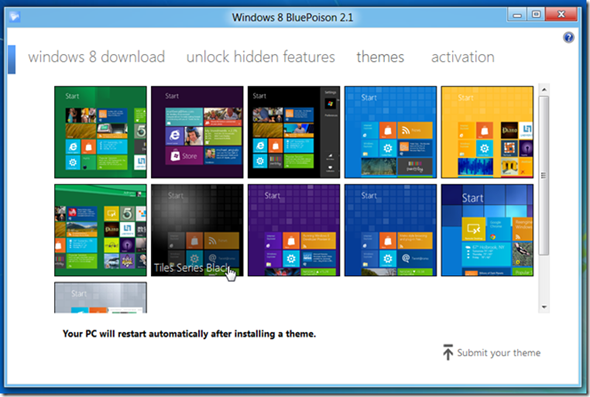 We’ve come across an all-new app today for Windows 8 Developer Preview: it’s called BluePoison and it lets you unlock a variety of hidden features in Windows 8. Details after the jump! The discovery comes from our friends over at AddictiveTips – a blog dedicated to covering the latest tweaks and apps for different platforms – in a post where they discuss some of the features of BluePoison. Developed by Windows 8 Italia, BluePoison is an application for Windows 8 which lets you disable annoying features, enable hidden ones and customize Windows 8’s Start Menu theme. You can disable features like the Immersive Start Menu and enables ones like the Applications folder, full-screen Aero Snap for small displays. It also allows users to download a leaked build of Microsoft Office 2015 which we, of course, do not recommend since it won’t be stable and might mess up your PC. Unlock the Applications folder (BluePoison 1.x and 2.x). Disable the Start Menu Immersive (BluePoison 1.x and 2.x). Metro also activate the snap on screens smaller than those supported (BluePoison 2.x). Once it is installed, you must run it as administrator after clicking on Run as administrator from the right-click menu. After launching, it will ask for your password (if you’ve set one) and then you can go to the unlock hidden features tab to, well, unlock hidden features! You can enable or disable allow features in one ago from the enable/disable all option. Users can also choose different themes for Start Menu from the themes tab. There are two other tabs inside the app: windows 8 download and activation. As you may have guessed, the former has links to the download page for Windows 8 Developer Preview (32/64-bit) and Microsoft Office 2015 (leaked) while the latter allows you to activate the three programs. Be sure to check out our Apps for Windows and Windows 8 category to explore more apps for your Windows PC.